COLUMBIA, Mo. — For the second year in a row, the University of Missouri is reducing housing and dining costs while adding more flexibility for students as part of the institution’s commitment to affordable education. The changes, approved by the Board of Curators last week, will reduce room rates for more than a third of available rooms and offer a more flexible, lower-cost dining plan option. In addition, the university will keep all residence halls open for fall, winter and spring breaks—providing greater flexibility and reducing expenses for students who wish to work or stay in Columbia over breaks. As a result of the rate reduction, students will be able to live and dine on campus for as low as $850 per month—a savings of nearly $150 per month compared to the lowest-priced plans this year. With housing and dining plan adjustments combined, Ward estimates that more than 83 percent of students who live on campus will pay less in 2019–20. Nathan Dare, president of the University of Missouri Residence Halls Association, said the new options and reduced housing rates will benefit students and their families. In fall 2017, MU announced that it would reduce base housing rates for more than one-third of campus housing options while creating a new economy housing option. The changes resulted in an overall 3.5 percent reduction in cost for the university’s most commonly selected housing and dining plans. The housing and dining initiative is one of several changes Mizzou and the University of Missouri System has made to increase affordability. Last week, the Curators approved a major partnership with Cengage Unlimited, one of the largest textbook publishers in the U.S., that will save individual students hundreds of dollars when purchasing textbooks for their classes in 2019. 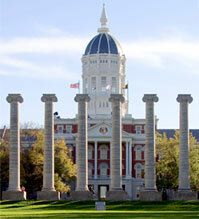 The Missouri Land Grant Compact — covers the tuition gap for any Pell-eligible Missouri resident. The Border State Scholars award — for eligible out-of-state students coming from one of Missouri’s eight border states: Arkansas, Kansas, Kentucky, Illinois, Iowa, Nebraska, Oklahoma or Tennessee. The Black and Gold Scholarship — expands MU’s out-of-state scholarships for eligible children of alumni. A new ROTC scholarship — covers room and board costs for the freshman year for incoming ROTC students who are national scholarship winners from the Army, Air Force, Navy or Marines. Changes to student charge — prevent students from accumulating debt for non-academic expenses. The UM Campus Stores continue to work with publishers and content distributors to lower the cost of course materials. Officials are projecting a 7 percent decrease in the average cost per class from $73 in FY19 to $68 in FY20.